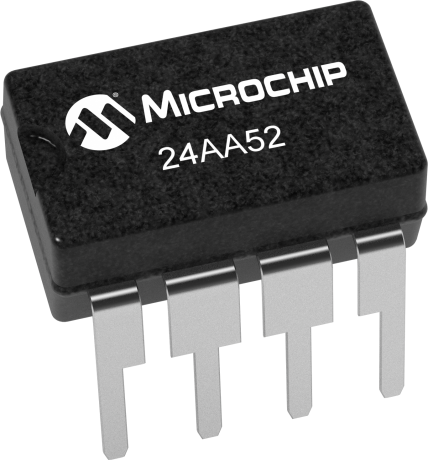 The Microchip Technology Inc. 24AA52 is a 2 Kbit Electrically Erasable PROM capable of operation across a broad voltage range (1.8V to 5.5V). This device has a software write-protect feature for the lower half of the array, as well as an external pin that can be used to write-protect the entire array. The software write-protect feature is enabled by sending the device a special command. Once this feature has been enabled, it cannot be reversed. In addition to the software protect feature, there is a WP pin that can be used to write-protect the entire array, regardless of whether the software write-protect register has been written or not. This allows the system designer to protect none, half, or all of the array, depending on the application. The device is organized as one block of 256 x 8-bit memory with a 2-wire serial interface. Low-voltage design permits operation down to 1.8V, with standby and active currents of only 1 µA and 1 mA, respectively. The 24AA52 also has a page write capability for up to 16 bytes of data. The 24AA52 is available in the standard 8-pin PDIP, surface mount SOIC, TSSOP, MSOP and DFN packages.